Don’t ever ask Why? Simply Try! ‘Why’ is such an easy, impromptu question, that arises ever so frequently in Life. And it invariably comes when things don’t go per your plans or when Life socks you in the eye, catching you unawares, numbing you, shocking you! Often, when the Why question goes unanswered__as all questions posed to Life will__you follow it up with an anguished cry of ‘Why Me?’. You are perfectly justified in asking either question. Because you deserve an answer to what’s going on in yourLife. Perfectly logical expectation. But Life never operates on a logic that you__or I__can or will ever understand. So, ‘Why?’ or ‘Why Me?’ then become the most futile questions ever in Life. Where does such insensitivity from Life leave you? What should one, who is beaten by Life, then do? Simply, suffer in silence? The Buddha recommends we try an intelligent solution. He has said this so beautifully. He said that suffering is optional, even while pain is inevitable. His wisdom pointed to an irrefutable truism in Life __ that as long as you are alive, you will encounter pain. But to suffer on account of that pain, is optional. Suffering comes onlywhen we pose questions to Life and resist a situation we find ourselves in. When people misunderstand you, you feel pained. But you suffer only when you insist that they understand you or when you resist them misunderstanding you. When someone you know dies, there will be pain. But suffering comes when you insist that death should not have happened and when you want that person back, alive, again. When someone cheats you, deserts you, stabs you in the back, there will be pain, but suffering arrives only in the moment you wished that what has happened had not happened. Or when you lose your job or money in your business, there will be pain. But it becomes suffering when you wish you had not lost either. All yoursuffering comes from wishing pain away. Osho used to tell the story of the great Japanese Haiku poet Issa. When he was only 30 Issa had already lost his five children. Then his wife died and he was almost completely mad — in anguish, in suffering. He went to a Zen Master. Issa was a man of great intelligence. He understood it. He came back and he wrote a Haiku. Life is a dew drop. Yet… and yet…. 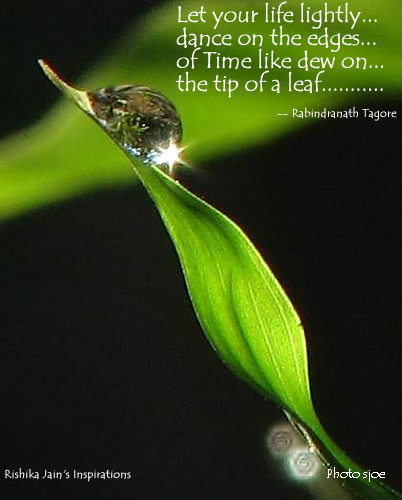 Osho, analyzing the Haiku, said the dew drop metaphor explained the transient nature of Life. But the ‘yet and yet’ usage by Issa pointed to the way we humans forget this impermanent quality of Life and how we allow ourselves to be overcome by grief when what we are attached to gets snatched away from us. Indeed. Our attachments bring us grief and that leads to our suffering. But, those like Issa who have been felled by Life’s blow, who have suffered, have always awakened to and understood Life’s transient nature. They have understood that Life is but a dew drop. Here now. And gone in a moment! So, when you encounter pain remember Issa’s story. Don’t ask Why anymore. Simply accept Life knowing that which is, is. Instead TRY to live with your pain. Initially, your effort may seem in vain. Because pain and you are strange bedfellows. But such is also the nature of Life that, that which you embrace, you befriend, stays with you peacefully. So, over time, with some trial and error, you will learn to accept your pain, your circumstance and learn not to suffer. You will then know that pain, when accepted, does not cause suffering, but, in fact, leads to you to peace! Author AVIS ViswanathanPosted on March 11, 2013 March 14, 2016 Categories Art of Living, Buddha, Death, Grief, Haiku, http://schemas.google.com/blogger/2008/kind#post, Inner Peace, Intelligent Living, Issa, Osho, Pain, Suffering, Why Me?, Why?Leave a comment on Don’t ever ask Why? Simply Try!